Me, mid elephant, in India. My son asked, “So, how was India?” I knew I had about two minutes to describe my trip, he was wolfing down Cheerios, about to be late for school. “It was a hot mess,” I said. Explaining further, it’s super busy and chaotic. Everyone is going and coming and doing a million different things in the span of fifty feet. No one seems to follow the rules, you’ll see trucks going down the wrong side of the highway. There doesn’t seem to be any zoning laws. It’s perfectly okay to paint your house bright orange, jerry-rig your electrical, and set up a shop (or home) on a street meridian. BUT there is something incredibly freeing about the whole place. The constant honking usually isn’t angry. It’s just a shout-out. Hey, I’m here, on your left, passing you now, hi there, here I come. Contrary to the, get the F out of my way MF, rage you can get and (sometimes) give here at home. We stayed at the Taj brand hotels with the exception of ITC Rajputana in Jaipur. My sister and I were doing a typical “first-timer” tour of India, The Golden Triangle– Delhi, Agra, Jaipur. Our add on was Lucknow, the capitol city of Utter Pradesh in the northeast. Known as the Nawabi City, Lucknow is steeped in history, rich with culture and architecture of the Nawab era. If you are interested in the Indian Mutiny of 1857, it’s a rich place to explore, especially for an Anglophile. There are very few tourists and you’re free to roam the monuments at your own peril (tourism without regard to law suits). I did get an unsettling feeling of… was it anger, disapproval, or just a weird sense of fascination from some of the men? I was looking for a silver jewelry box and my guide took me into a few small shops on a main commerce street in Old Town. I took off my shoes as instructed, but there was no welcome or smile from the proprietor, on the contrary, it was more like, what is SHE doing here? Also, while visiting the British Residency, the ruins of a large British township that was under siege during the Mutiny, we were openly learned at. I asked our guide, “Do they hate us? Or is it socially acceptable for men to stare?” He said it’s because we’re white, “They think you’re British and in this area, the British are not well liked.” Obviously there isn’t a factual answer, it’s a feeling, something you can’t exactly Google. What turns this whole story on it’s head was the very nice welcome and hospitality we received at the the Vivanta Gomti Nagar Lucknow, the Taj’s number two brand, followed by the Gateway and the Ginger hotels. I met Sales Managers Alpana Singh and S. Shabahat Husain for tea and they told me that the hotel was rather new (15 years), and built in the colonial style of the British Residency, with influences of French and Mughal (Nowabi) architecture. They explained that while they would like Lucknow to attract more tourism, right now their clientele is mostly there to conduct business and the Vivanta Lucknow caters to that customer. Ms. Singh, who started working for the hotel one year before it opened, said the hotels biggest asset was being part of the Taj brand. Immediately, consumers know to expect excellence from the brand and that is what ultimately drives sales. To best describe the excellent service we received, I have to tell a quick story about Swati, an on-duty service manager, I got to know. My sister had purchased a sari from a popup store in the hotel with the idea that she would wear it at a gala the following night. The custom blouse that goes with the sari would not be completed in time, but she could wear a gold t-shirt instead. The next day we got back to the hotel with an hour to get ready for the gala and Bonnie, my sister, said she couldn’t wear the sari because she didn’t have a matching petticoat. This is a drawstring underskirt, that you tuck one end of the sari in to. I’m a fashion stylist and I wasn’t going to let Bonnie leave the hotel in nothing else but that sari! I called Swati. I told her not only did we need the petticoat, but she had to come back to put the sari on because I didn’t know how to do it. She said she needed the sari to match the fabric of the petticoat and that once she had it in hand, she would bring it to the room and put the sari on Bonnie. With 45 minutes left, I had my doubts about pulling the sari mission off (honestly, I wouldn’t have bet a rupee on it). It’s India, just thinking of the traffic and craziness outside, I felt defeated. Not only did Swati arrive in time to put the sari on, but the petticoat was the absolute perfect match to the sari fabric. Swati, duty manager and valet too. I’m sure there is amazing, adventurous, eating in local markets and city restaurants in India, but Anthony Bourdain I am not. Taking advice from my sister and friends who have been to India, I stuck mostly to hotel dining. Yes, I wanted to be more authentic in my food choices, but like forgoing train travel, I didn’t want to take chances with the timing of our trip, being sequestered sick in bed or stuck on a train, was not an option. However the Taj Hotels offer such fantastic dining, there is no compromising to be done. Vivanta Gomti Nagar Lucknow has a one-of-a-kind restaurant called Oudhyana. The dining room was like being in a Tiffany jewelry box. Despite the fact that I was wearing a sequined gold skirt with a gold silk charmeuse top and jeweled sandals, I felt under dressed. In this dining room you should bathe yourself in silk and jewels and finery from head to toe! If ever you need to indulge a Nowab fantasy, this is the place to do it. The cuisine type is Awadhi, a northern India cuisine specific to Lucknow, but similar to Central Asia and the Middle East. Think slow fire stews, kebabs, korma–a big spread of small plates set before Nowabi princes during the Moghal era. Sous Chef Harish Chand Sharma makes this fantasy come to your table. A small selection of dishes worth remembering and mentioning here include: mustard fish, mutton kabab, and a vermicelli dessert. 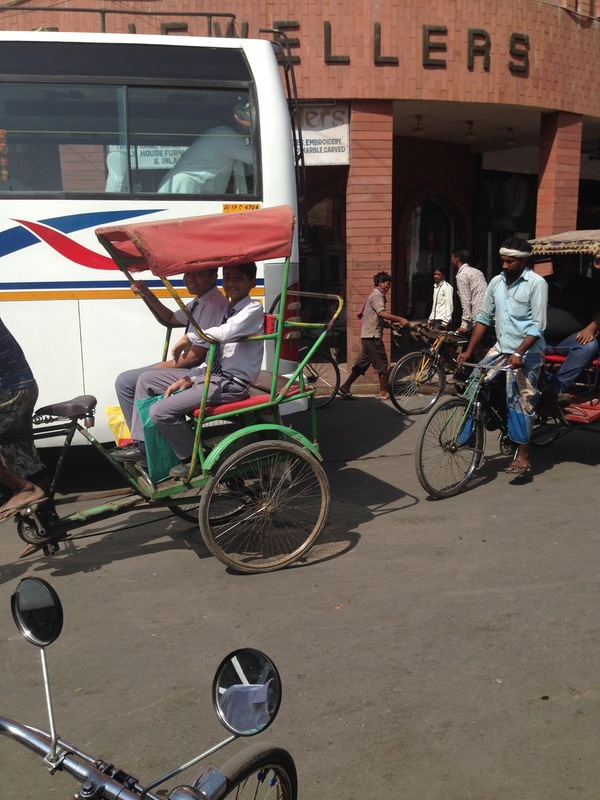 If you find yourself in Delhi, and anyone on a Rajistan Golden Triangle tour will, make sure you hire a bike rickshaw and take a ride through Old Delhi, this slice of India gave me a sense of place like no other. The rickshaw driver who weighed at least 35 pounds less than me (okay I’m 145) was managing with a bike chain that kept quitting on him. So he ran half the time. My sister was next to me (I’m not going to tell her weight). The driver was undaunted! Our guide Pushkar, a young man with fashionably saggy pants, took us through the spice market and to a Sikh temple where we also toured the adjoining kitchen. The kitchen had wok-like pots big enough for three four-year-olds. The ladies, patting, balling, and tossing dough seemed as chatty and comfortable as any feminine DIY gossip group the world over. They were getting ready to feed 100 plus, free of charge. I asked Pushkar what he wanted to do after being a tour guide. He said his plan was to retire at 35 and open an ashram in his home village up north, a lofty aspiration and rather different form western 20 somethings! The stand out meal in Delhi was at the Taj Mahal New Delhi (The Taj Mansingh). Surprisingly, it was Chinese food. Dining at the House of Ming felt like being in a James Bond movie. One of those scenes where he is somewhere in the world being totally handsome, smart, international, glamorous and well fed. The House of Ming prides itself on being a favorite of Delhi’s elite and while I didn’t recognize any Bollywood film stars, I bet they were there! Celebs aside, it was a tantalizing meal with tastes twisting and turning in my mouth – hot counteracted by sweet, soft in opposition to crunchy. Order the lotus stems tossed in seasonal honey and dried red chilis. I’m not sure you can get them anywhere else. Me at the Baby Taj. Home to the Taj Mahal, Agra is probably one of the most touristed spots in central Asia. My neighbor Surendra Shah gave me some excellent advice before my trip. He said to see the “Baby Taj” before visiting the Taj Mahal. Did we follow said advice, no, our schedule was turned around so we visited I’timad-ud-Daula (the Baby Taj) after seeing the Taj Mahal, but at sunset, and it was precious in comparison, like hearing flutes instead of drums. 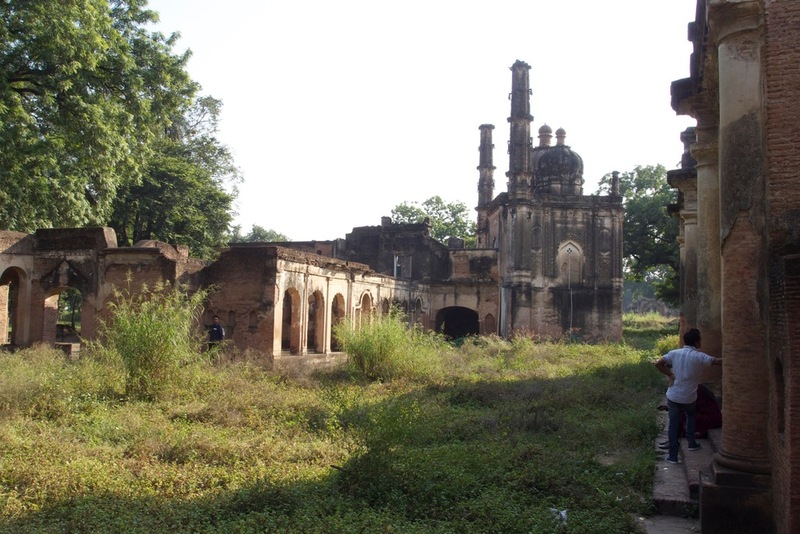 Like the Taj Mahal, I’timad-ud-Daula is a tomb. It is a precursor to the Taj, the first Mughal monument to use white marble and inlay. I’m not a Moghal scholar, but to me the architecture and inlay work was every bit as artistically jaw dropping as the Taj. 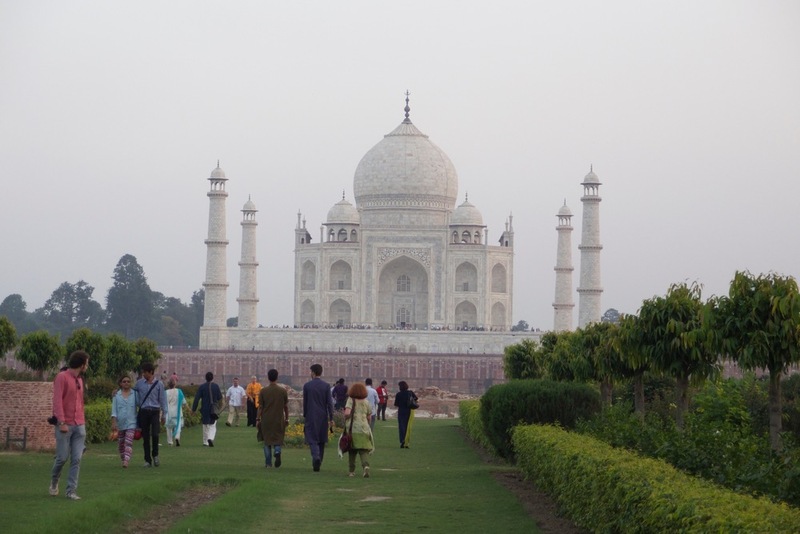 The other bit of advice from Mr. Shah was to see the Taj Mahal from the Mehtab Bagh (Moonlight Garden) before visiting. This advice we did follow and it was a perfect build up to seeing the Taj Mahal the next morning at sunrise. Mehtab Bagh is situated along the Yamuna River just opposite the Taj Mahal and the Agra Fort. It was the last Mughal-built gardens along the Yamuna and was said to be the chosen site of a black marble mausoleum (identical to the Taj Mahal) that Mughal Shah Jahan wanted to build for himself. However, in typical Mughal dynastic fashion, excellent fodder for a dramatic TV mini-series, Shah Jahan was imprisoned by his son Aurangzeb and the black Taj was never to be. Peshawri restaurant at ITC Mughal, was our favorite meal in Agra. Riffing again on a movie reference, here I thought of Omar Sharif in Laurence of Arabia. Picture an exotic caravan tent set from a 50s MGM movie, except without the tent, the walls with their jagged tiles say cave more than ten, add lots of orange, green and red cushions and rugs, beaded screens, low lights, no dancers but a serious yet friendly waitstaff with oversized turbans… and you’re there. The food is inspired by the North-West Frontier Province, which encompasses parts of Afghanistan and Northwest pre-independence India. It’s a tradition of clay ovens and tandoor, it’s not saucy. We had some huge prawns fire cooked on a yard long skewer, a sword really. The method for marinating the prawns was to use a big butter drenched rag (or cheese cloth?) and squeezed it over the prawns. Delicious. The lower left point on the Golden Triangle tour is the city of Jaipur home to the stupendous Amber Fort, but there are two stops on your way there from Agra that should be made. 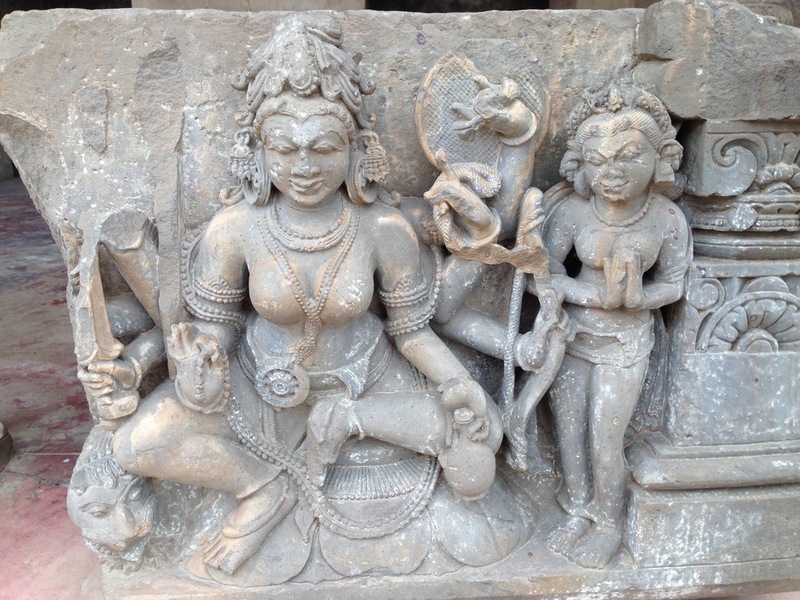 They are Fatehpur Sikri and the Chand Baori step wall in Abhaneri. Fatehpur Sikri is an imperial palace city built by Mughal emperor Akbar. Visiting the complex gives you a frame of reference for the whole Mughal dynasty and it especially emphasizes the splendor and brilliance of Akbar’s court. If I had to choose to run away with any one Mughal emperor, it would be Akbar! His ability to assimilate different cultural influences and religions in the architecture of Fatehpur Sikri is unparalleled. His courts became the center of arts, literature and learning and he championed an Indo-Persian culture, which thrived on religious acceptance. There is so much history and lore to garnish from this magnificent palace city that you should be very particular about your guide and read up on Akbar The Great before you go! Maybe it’s because Bonnie and I were the only ones there, but The Chand Baori Stepwell did feel mystical. A local guide took us around the top most part of the well describing the Hindi gods and goddess on various stone pieces lying about. Looking down into the giant hole that is the well, one could get vertigo. The name “stepwell” both describes how it works and what it is. You step down stairs to get to the water accumulated at the bottom. Women were most often associated with the wells, because they collected water while offering prayers. The Chand Baori stepwell has something like observation rooms overlooking the well with ornate architectural details now in semi-ruin. Being there, you could almost hear the laugher, gossip and chatter of the women seeking water and refuge on a hot summer day. Note: The Golden Triangle sites are a lot about the Islamic Mughal Dynasty of the 16th century. The Chand Baori stepwell was built between 800 and 900AD and it is Hindu, dedicated to Hashat Mata, the Goddess of Joy and Happiness. In Jaipur there are several requisite tourism sites, but the one that was stand out for us and most any visitor, is Amber Fort. I knew we would be riding a “Amber Fort Elephant” up the access road to the fort, a rather hokey way to get there (not to mentioned probably unsanctioned by animal rights activists) but I couldn’t wait to get on that elephant! I had a big agenda to recreate the picture of my fashion idols Lee Radziwill and Jackie Kennedy on an elephant in India, sans the white gloves, and I did it! Amber Fort also known as Amber Palace has a layered history with many medieval structures destroyed or replaced, but today the palace complex of the Rajput Maharajas still stands. Like India itself it is enigmatic. So dramatic in form, grace and intricacy, one doesn’t know where to look first. Glimpse a reflexion of yourself in Shesh Mahal (Hall of Mirrors), your face is cut into bits, your image is reflected a million times over, it is both disconcerting and awe-inspiring. Disconcerting and awe-inspiring. That is the hot mess that is India. While in Lucknow, India with my sister this this past October, I stayed at the Vivante Hotel, the Taj’s number two brand, after The Taj and followed by the Gateway and the Ginger hotels. The Vivante Lucknow is only 12 years old and built to look like the British Colonial Residency. To best describe the excellent service we received there, let me tell you a quick story about Swati, an on-duty service manager we got to know. My sister Bonnie had purchased a sari from designer Ruschika Modi, who had a popup store in the hotel, with the idea that she would wear it to a gala the following night. Amazingly, Bonnie was able to make up her mind pretty quick about which sari to get. Check out the pictures, the array of beautiful hand woven Benares silks just freaked me out! The next day we got back to the hotel with an hour to get ready for the gala and Bonnie said she couldn’t wear the sari because she didn’t have a matching petticoat. This is the drawstring underskirt, necessary because you have to wrap and accordion tuck the sari fabric into it. No way was I going to let Bonnie go to this gala not in Ruschika’s sari. I called Swati. I told Swati not only did we need a petticoat, but also she had to come back to put the sari on because I didn’t know how to do it. She said she needed the sari to match the fabric of the petticoat and that once she had it in hand, she would bring both back to the room. With 45 minutes left, I had my doubts that we would pull the sari mission off. It’s India, the traffic and craziness outside the hotel can only be described as a colorful hot mess. Not only did Swati arrive in time to put the sari on, but the petticoat was the absolute perfect match to the sari fabric. Swati, we loved you then and still do! There's a lot of good stuff in this magazine! I was psyched when editor Carolyn Worthington of Healthy Aging magazine asked my to write the spring fashion feature for her magazine. It would feature the Carlisle, Per Se and Per Se White Label collections that I work with every day. These clothes marry well with my favorite theme, travel + style. It's fashion easy to love. The biggest problem my clients are having this season? Deciding what not to buy. Check out Healthy Aging here. When designing or crafting is a group effort, there always seems to be the unsung hero. A behind the scenes guy that only the relevant few know about. I found myself awe struck by the pattern makers at the Carlisle design facility. They quietly cipher a design, engineer it, coax it, manage it. The end game is a garment that actually works on your body. It fits, bends, moves and stretches. Repeats in the fabric are managed, pattern pieces are laid out keeping economy, fit and beauty in mind… Most pattern makers have a design back story of their own. They come from a family of tailors or they obsessively made doll clothes as a child. Here's a video of the Carlisle / Per Se pattern makers at work. I recently toured the Carlisle/Per Se design and production offices in New York City. Obviously, I'm committed to the brand. I wear the clothes. I sell the clothes. I believe in the quality. I love the design. Now, I love the clothes all the more! I fully understand and appreciate what it takes to create the collections. Besides that, it's just really cool to be able to wear the clothes of a designer you've met and gotten to know! Here's a few video clips and some pictures of Susan Klope, the designer of Per Se. You get a feel for how she works and her level of passion for all things that make up a garment; lace, weaves, yarns and buttons. Look carefully, several of the background pieces will end up on next winter's Per Se runway! I'm a Binkley fan. I read her fashion column in the WSJ whenever I can and I'm usually both informed and impressed. She can write about fashion without sounding vapid or snobbish, not easy. In her article The Leaner, Meaner Power Suit she give a great little crash course on the history of the power suit for women and peppers the article with some good statistics as well. Apparently some 3.9 billion women's suit will be purchased this year, their market share up 27%. Ahead of the trend, Carlisle / per se has been doing some great suiting for the last several seasons that is "powerful" and provocative, for a woman who is, well... a woman. Clients are usually scared of being matchy, matchy, so I've been breaking suits up, but lately I'm feeling like this is less of an issue. Executive women are actually gravitating towards the whole suit. Finally! Gallery hop NoHo, lower east side–After fuel at La Colombe walk down Mott street to Broom Street and view the Esther Rosa installation at S Artspace Gallery. Ms. Rosa has done a series of calming abstract paintings that are layered, organic in feeling and materials and decorator friendly, in that they'll work in most any room. I'm sure that's not the reason to buy art (and most artists would sniff at me for saying so), but it's always something that comes to my mind, "Can I live with this? Will it work in my living room? Will I always love it?" Rosa's large sculpture made entirely from coffee filters, all dyed to varying degrees using coffee, and of several different sizes, is weird, wonderful and completely unexpected! This was what I wanted my friends to see. I think it is a daring piece to host and bodes well for creative happenings we can anticipate from this gallery. Gallery owners Elizabeth Rosso and Catherine Testorf make the art, the space, the experience that much more inviting with their enthusiasm for this particular artists and the others they have, and will be showing. Walk east to Woodward Art and check out "DETAIL." It's no surprise that I loved Susan Breen's little cut-out painter's palette dresses, charming. In fact, it seemed this show had a little something for each of us to relate to and appreciate and want! Question: When did Orchard Street become gallery land? I bought my first business suit there from a Hasid who knew about fit and sensible style. In the late 80s I cut the skirt too short, but the slim jacket, a woven tweed, looks like one from Ralph Lauren's fall collection. Ha! I think the MET (Metropolitan Museum of Art, NYC) would be on my top ten list of places I like to be. It's an art feast and I am eating it up! Often, especially on cold, winter (even though it's March) days, I want to ditch New York and go back to Cali. But a half day looking at what mere humans are able to create, is incredibly satisfying, inspiring and uplifting. I leave the MET saying, I love New York and I'm not even in a Woody Allen film. Today I saw Impressionism, Fashion, and Modernity. The name alone tells you why I wanted to go! It was a fabulous collection of mostly full body portraits by celebrated impressionist. Many of the painting were from the d'Orsay, so it felt like a museum visit in Paris. Tissot's works were my favorite. Surprising, because he was the least impressionistic. A silly take away; I need more stripes in my wardrobe! My girlfriend and I followed up our pretend Paris visit with paninis and Champaign at Sant Ambroeus. I had an answer to my earlier musing... Yes, at this place, I am enamored with my own era! The impressionists would have captured a buzzing, delicious, sophisticated, fashionable moment in my very own time! I love to pack! The anticipation of going somewhere and packing just the right thing makes me feel like I've aced an exam! As a fashion stylist, I've made a whole profession out of counseling people on just what to wear for any occasion at home or abroad. When I travel, I'm reporting on the fashion scene and finding ways to absorb stylish ideas to use in my styling work with clients. As for styling work, I'm a stylist at the by-appointment Carlisle/Per Se Showroom in Greenwich CT. and I travel there almost daily. Just 40 minutes from Grand Central (NYC), Greenwich is considered one of the toniest towns in America! Visit the Bruce Museum, the shoe department at Saks–fab, window-shopping up and down the Avenue, and of course the Ralph Lauren mansion store. I like Morello or Terra for lunch or drinks or sometimes I'll grab a sandwich and just sit and watch the Sound (Long Island). Another cool place, on the opposite coast, to be seen and check out the scene is Napa. My article "Take 5 in Napa" for Travelgirl Magazine described a fall girlfriend getaway sans car. Take the Wine Train up the valley and fulfill your Agatha Christie dreams or visit the Oxbow Public Market where cool meets country. While most visitors to Napa are elbowing to get a reservation at The French Laundry, we opted for Cuvée Napa the atmosphere and clientele made for excellent style watching and the food and wine pairings were extraordinary. No winter is complete with out buckling up boots, ski boots! I have a printed/laminated list of everything one needs to wear and bring skiing. If I didn't like clothes so much, I'm not sure I would love the sport! We skied local this year. Jiminy Peak and Butternut ski resorts in the Berkshires made enough snow to satisfy visitors while mother nature occasionally chipped in. The fashion scene on these hills is well, non existent... My new Montclair ski jacket needs a trip to the Alps! Early summer in Portland Maine is all about–light houses, adirondack chairs, lobster... This stylist put on full lobsterman gear and boarded a lobster fishing boat to catch those gnarly creatures and catch them, she did! Lunch was my lobster catch dockside. Next was a stone massage at The Inn by the Sea's spa. This classic, contemporary Inn is Maine at it's best. Wear sweeping linens, straw hat and espadrilles. You'll feel like you belong in a Winslow Homer painting! What's more you can visit Homer's Studio while in Portland. Follow that up with a food and wine tour of this unexpectedly hip New England town. Palm Springs is HOT in August! Skimpy summer frocks, a must! The town is tourist free and there are off-season deals to be found. The Viceroy Hotel makes for feeling fabulous. It's ultra chic, goove-a-licious–everything the Rat Pack had in mind when they made this town their playground. Make sure to visit the "design district" and stop by Flow Modern Design store. If hiking is your thing, the desert makes for interesting vistas and a fizzy cocktail post hike is deserving and appreciated! My choice? A margarita of course! Smack in the middle of Umbria, which is smack in the middle of Italy, is a small medieval town called Narni. Narni hosts the Narnia Arts Academy, a cultural/artistic festival in July. One unexpected offering in the "Culture and Leisure" program at the festival is Tango Dancing. Ladies, imagine tango dancing with a handsome Italian in tight pants. What's more, he's teaching you how to do it, no experience required. But perhaps food turns you on more. If so, you can take regional cooking classes at the festival as well. Classes are held in local restaurants and medieval taverna. The Culture and Leisure programs has offerings for one or two weeks and includes excursions to Rome, Perugia, Assisi, Spoleto and more. Every manor of accommodations are available and at prices way below "big city stays" for that time of year. This medieval hill town is pumping with music, dance and art during the festival (actually, most of the year). Stroll from one side of Narni to the other in about 10 minutes, do it at night, under the glow of street lanterns, with your real (or pretend) tango partner! Side note: Narnia is the Latin name for Narni and it is from this city that C.S. Lewis took inspiration for his book "Chronicles of Narnia," which has nothing to do with tango. I'm sure you can relate to being lost in a foreign country and having trouble deciding if you’re excited, or terrified! There is a perfect T-shirt out there that shows and says just what to do–breath! Hands Turned On has fitted Ts that say things like “Excitement Without Breath is Fear, “ “Ten Seconds To Center” and “Practice Extreme Gratitude.” These soft cotton tops come in sherbet colors and have handprints on them, which display where to put your own hands to practice self healing (or self calming) techniques. The shirts come with a nifty hangtag that guides you in performing energy healing/breathing practices that are unique to each shirt. Renowned energy medicine healer Dr. Ann Marie Chiasson wanted to launch a product that would give customers easy access to the use of energy medicine anywhere! The shirts allow the wearer to jump into a healing practice without going to a workshop, class, healer or clinician. Besides that, they look cool, travel well, feel good on and spread a great message. The shirts are available online at the company’s website, www.handsturnedon.com. I thought I'd show you some terrific dresses from Carlisle / per se's summer collection. This season my clients will receive $200 off on a purchase of three or more pieces. I'm always interested in having groups of women up to the showroom to see what kind of spectacular service we provide and to taste how much fun shopping privately with friends can be. If you'd like to collaborate on a small event, please get in touch with me–wine, mimosas, appetizers and fashion–could be fun! Now for some dresses–easy, breezy–one piece + jewelry = your done, dressed and fab! Can you hear the drum beat?! A few weeks ago I roped my friend LB (you don't really have to rope her though, she's up for almost anything) into to seeing an exhibit at the Museum of the City of New York. I knew I would enjoy the exhibit, Cecil Beaton, the New York Years, but I didn't know what to expect from the museum. It's a beautiful landmark building undergoing an $85 million expansion on 103rd street, a gem. The Beaton exhibit is big enough to spend time at each photo and illustration, reading about the fabulous life of this accomplished, photographer/designer, but not too big that you just can't take it all in. I think most of us know that Beaton was the designer behind the costumes in both the movie and stage version of My Fair Lady. He started his career in fashion photography for all the big New York mags, chronicling the most popular designers of the 30s, Mainbocher, Schiaparelli. His shots were very theatrical and staged, a technique that is actually getting more popular today. Beaton then turned his focus toward design; interiors, costumes, sets. He lived in and redesigned suites at posh New York City hotels, including the Pierre and the Sherry Netherland. This exhibit flew in the face of all those well meaning career advisors that encourage creative people to pick just one thing, and do only that, and that is what I liked about it best! Now through February 20th. The results of Liz Tailor’s estate sale were staggering. I went to the preview exhibit and was stunned by the massive quantity of things one person could acquire over the course of a lifetime–purely for adornment. Rooms and floors of stuff, stuff, stuff! Former husbands and friends seemed to interpret Liz’s taste differently. Jackson’s gifts were slightly ridiculous, Todd’s, fairy princess, Burton, serious duchess, and Liz’s own designs were oversized and exotic, like she raided an Egyptian tomb. East Broome Street in NYC was our quick world tour as my friend Brigitte and I took in Swiss artist Regis Colombo’s exciting imagery at sohotel – Art Space Gallery. Each work is dedicated to a city captured in a collage of nuance both subtle and bold. Entitled “Transparencies” Colombo works his magic with camera and mouse crafting layer upon layer of images that dance together in vibrant color and black and white. Now through December 18th the show is mounted in a raw, yet inviting street space of the sohotel. A perfect compliment to the show is a drink next door at Bar Coffee, The Randolph at Broome. Here, layer upon layer of booze and bitters make a tasty, colorful work of art you can drink! If you’re looking for sweets, Italian sweets, sweet living, then and now… Go to Eataly, NYC. There, you’ll find the sweet life, “La Dolce Vita” in every direction. Eataly is the perfect stage to play out almost any Italian fantasy, especially with regard to food and wine, but it also celebrates La Dolce Vita–love, life, energy, joy. It hums. Be sure to look up. Hanging from bars suspended from the ceiling is this wonderful exhibition curated by Marco Panella. Stars at play and work in Italy during this glamorous decade are on display in a captivating black and white pictorial. Toast to the likes of Tyrone Power, Mamie Van Doren and, no surprise, Sophia Loren. Executive Director of American Ballet Theater Rachel Moore came up to the Greenwich Carlisle / per se Showroom not too long ago to check out the fall lines. I knew the brand would be a great fit for her. When I asked her what her M.O. was in terms of her style and wardrobe choices she said, “I always want to straddle being polished and professional, but not boring.” And because she represents a world-class ballet, she’s got to be slightly “arty” without being too funky or “downtown.” Imagine, in any given day Rachel might go from meeting with bankers, to a donor’s luncheon to a gala performance. How does she do it? She has no apologies about having to change clothes! Better to be dressed exactly right than having to hodge-podge something together that isn’t perfect for the day or the evening function. This definitely flies in the face of the day-to-evening how-to dressing every fashion journalist has written about (including me!). If you’re a former ballet dancer, you’re a friend to practice and preparation. Rachel’s packing regime sounds like trying to synchronize the intricate choreography of the four cygnets dance in Swan Lake! She explained, “I’ve given up the goal of traveling light. I know my schedule before I begin to pack and I literally plot out every outfit before I leave.” She creates a spreadsheet of what to wear from event to event, including evening bags, shoes–the works. Perhaps she could economize in her packing a bit, but there is no way she’s going with just a carry-on and besides that, as she said, “I want my stuff!” Who can’t relate to that! Shown here is one selection Rachel made at the Greenwich Showroom. She fit beautifully into everything and it was difficult for us to narrow down the choices into a few outfits. I think you’ll agree it’s arty without being too funky and it says I mean business, no phony baloney. Mr. Client wanted me to meet him at my.suit in the city (NYC) to see how his new custom suit looked and fit. I was intrigued by my.suit's website and Mr. Client had said he was reasonably pleased with the fabric and design choices offered. I was given a quick tour of the store before Mr. Client arrived by Product Coordinator Shao Yang. She explained that there are two tiers of fabrics, both in quality and price points. The mills for my.suit are in Mexico and the suits are made there as well. Mexico's fabric pedigree is rather "quarter horse," not exactly thoroughbred. BUT I liked the fabrics, the hand was very good, the choices great! And the prices were pleasing enough to get me over my fabric snobbery, not Italian, not French, sniff. The big test came when Mr. Client put on his suit. It was nice, a two button, double vented jacket with flat front pants. Mr. Client had chosen a bright orange lining, sweet! The pants needed tweaking, although not much. We then collectively, with strong opinions from me, chose three more suits. I was giddy with the freedom to actually design the suits. One has full rein to make an abundance of choices, even down to what thread color you'd like on a button hole. Mr. Client's profession doesn't beg for green seersucker or a navy jacket with orange piping. He's not a JT or GC (guess), but he had found the right place to get something perfectly "suited" (forgive me) for him.